Spider-Man: Homecoming was a blast, not least because of the litany of Stark-manufactured gadgets at Peter Parker’s fingertips (and web shooters). But stuff like that blows any hopes of us dressing up as an authentic Spider-Man out of the water. 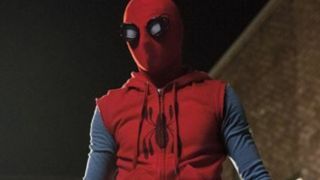 Don’t worry, though, a resourceful Redditor has found a way to create Spidey’s homemade suit – you just need an Amazon account. Reddit user Venom349 (H/T ComicBook.com) has compiled a superhero shopping list to craft the suit that Peter Parker donned once Tony Stark stripped him of the suit (not literally, that would be weird). Remember kids, that student Prime discount always comes in handy. Strangely enough, as you can see in the image above, all of the items are listed in the related section of a pair of welding goggles (which you can totally buy here). There are pullover socks, mesh for the goggles (in case of Vulture-related incidents, I guess) and some nice, comfy (red, natch) trainers. Halloween isn't far away, guys. Just sayin'. If you’ve got some money lying around you can pick up the gear today (the items are all pictured above), but be quick: It looks as if everyone else has had the same idea. For more Homecoming news, check out why Tony Stark is being replaced in the sequel, and why Homecoming’s most iconic scene isn’t even in the movie.